Everyone's Costumes Seem to Be Improving on Day 5 of Figure Skating!! Figure skating rages on and as it does, my personal rage at their little costumes subsides; perhaps it’s because I’m now used to sequins and egregious furbelows and ombré chiffon. Some costumes were good; some were bad; most were kind of ugly! Fitting. Let’s get your medal award winners out of the way first. Meagan Duhamel and Eric Radford made the choice to repeat the ‘stume from their Olympic debut, which means I am once again assaulted with this offensive neckline and Radford’s going-out top. Ugh. Aljona Savchenko and Bruno Massot TRULY fucked the game up, skating-wise, but costume-wise, this is just so-so. Massot’s top is another crime against the male torso and Savchenko’s purple and white ombré chiffon number has some detail that interests me — that slim strip of illusion netting in the front led to an open back, which I respect—but is otherwise blah. The detail on Han Cong’s all-black top from the front is excellent, but when he turned around, there was a diamanté dragon on the back, so I’m gonna have to pass here. Sui Wenjing’s spangled number is giving me bougie cousin at your family’s lunar new year celebration and I love it. In the words of my high school dance teacher, Ms. Jacqueline Burgess, now we’re cookin’ with gas!!! Here are Tae Ok Ryom and Ju Sik Kim in some very chic and excellent unitard and unitard-adjacent ice skating couture. Ryom’s rocking a halter neck is less egregious when attached to a black and Swarovski look with a mesh cutout in the middle that continues down the leg!! Her partner Kim’s top is looks remarkably similar to a Cheap Monday going-out top circa 2005—works for me! Nicole Della Monica and Matteo Guarise are an exception to my previously-stated rule that figure skaters should NOT dress like identical twins; THIS IS SO GOOD AND RIDICULOUS AND VAGUELY ’80s I LOVE IT AHHHH. Vanessa James’s commitment to a uni is great and her partner Morgan Cipres looks just okay. Julianne Seguin and Charlie Bilodeau—boring black on him, and the same sort of sequins-as-mold-or-infectious-disease flair on her otherwise excellent red costume. Sadly I was unable to observe most of the performances due to my living room being used for a romantic Valentine’s Day event, but I’d like to believe that Anna Duskova and Martin Bidar’s costumes went with some sort of kicky, jazzy number—if not, BURN IT!! I have nothing good or bad to say about Xiaoyu Yu and Hao Zhang except that I like his red necklace and the sort of drab cuffs on his top. This yellow ditty on Kristina Astakhova is reminiscent of Ashley Wagner’s stunt in mustard from the 2014 Olympics in Sochi, but Wagner’s was so great and this is just fine—the Forever21 version of a Zara dress that is actually Chloé. Her partner Alexei Rogonov’s tie is simply unforgivable. 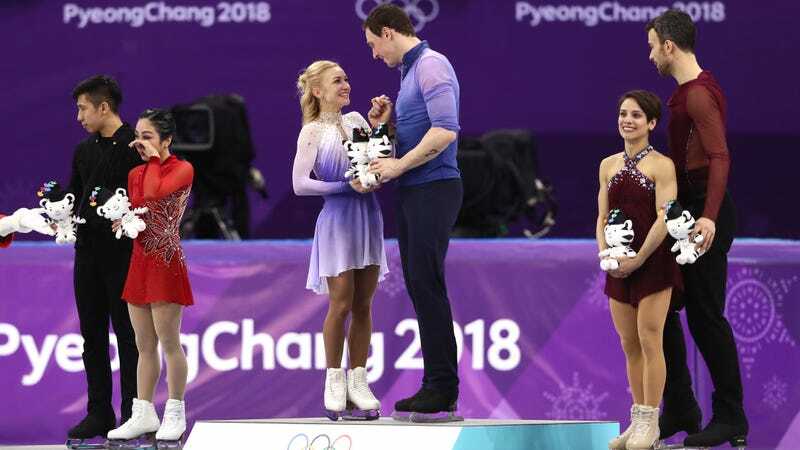 Natalia Zabiiako and Alexander Enbert were uninspired as were Kirsten Moore-Towers and Michael Marinaro; I appreciate their athleticism and am honestly physically incapable of doing anything CLOSE to what they’re doing on the ice, but I am not here for these outfits. Everyone sort of improved tonight, except for Evgenia Tarasova and Vladimir Morozov. What is this!? Who? Why? I admire the tenacity of spirit it takes to wear a cut-rate swing dancing competition costume modified for the ice, but I am EXTREMELY upset about the poorly-executed illusion netting and I refuse to acknowledge that tie. Oh well! Skate good! Next time!